After years of bad breakouts followed by periods of clear skin, I decided to take some action to make my skin a little better. I try not to use a lot of chemicals in my daily life but talking to a few friends who had to take Accutane (intense acne medication) got me started on a path towards figuring out how to clear my skin. For the past two months, I've been taking some vitamins and supplements that have cleared my skin out tremendously! First, I started taking a daily multivitamin - I like the gummy ones even though they are not vegetarian. I take two in the morning along with my usual routine. There is not a brand that I am loyal to - I buy whatever is on sale or makes a good deal with the other things I take. Second, I started taking a 10,000 mcg Biotin with 100 mg of keratin pill every day - this seriously helped to clear my skin. I noticed that my skin started to glow more as I took this pill every morning. I just take one a day in the morning with something to drink! My hair is growing a lot longer each month but I can't be mad about that side effect! Third, I started taking a 500 mg Evening Primrose Oil pill to help level out my hormone levels and add some healthy oils to my skin. This needs to be taken daily about the same time everyday WITH FOOD. Without food, it makes me super nauseous. I find that after month on it, my period pimples were not terrible and my body felt a ton better. 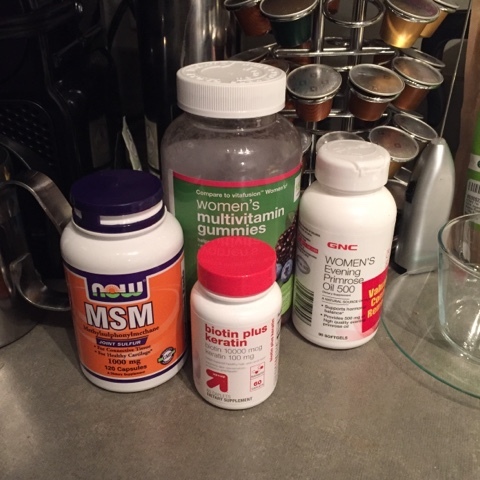 Lastly, I've added MSM pills to my regimen. I take 1 1000 mg pill every morning WITH FOOD and some sort of vitamin C to increase the efficiency. MSM is just sulfur in an good form for your body to absorb. Sulfur externally helps my skin in a mask I do once a week (thank you Peter Thomas Roth) but taking it internally helps detox the liver and the body in general. The first week, I felt a little bit more of a break out but with an increase in my water intake, it all went away. Together, these 4 things have cleared my skin up to a point where I stopped worrying about acne scars or breakouts. I am toying with adding some apple cider vinegar pills ( I take a shot daily to keep my immunity up) and Chromium pills based on a website I read. I know it sounds silly but trying all of these products on the outside of my skin didn't solve the problem - it was all about the inner body that made my acne clear up!